Generally Democratic voters live in Big cities..suburbs are traditional republicans. Population is heavily concentrated in big cities. In many villages population does not exceed 1000! OKவில் ஒரு கவுண்ட்டியை கூட ஒபாமா கைப்பற்றவில்லை. வடகிழக்கின் ஐந்தாறு மாநிலங்களிலும், விஸ்கான்சினிலும் மெகயினுக்கு இதே நிலை. கான்ஸஸ், வெஸ்ட் வர்ஜீனியாவிலும் ஒரேயொரு இடம் தவிர எங்கும் சிவப்பு மயம். 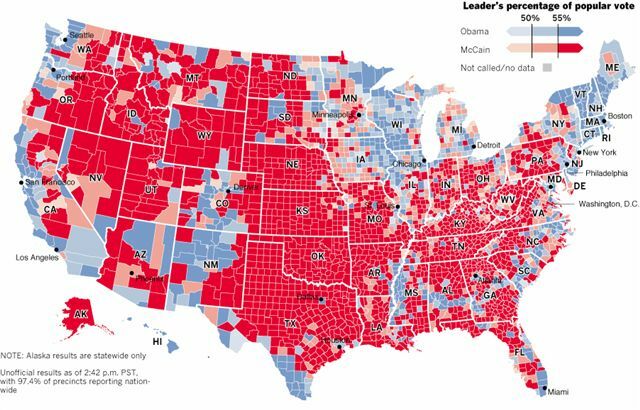 In 2004, the reddest of the red was Utah, where George W. Bush won 71.5% of the vote. … where Kerry surpassed the 60% figure. Obama, by contrast, exceeded that figure in 10 states. In 2000, Bush posted his best showing in Wyoming, where he won 67.7% of the vote (running a close second: Idaho, where 67.1% of the voters backed him).